Thai troops opened fire on protesters for a second consecutive day of fierce clashes in the heart of Bangkok that has left five people dead and at least 46 wounded. 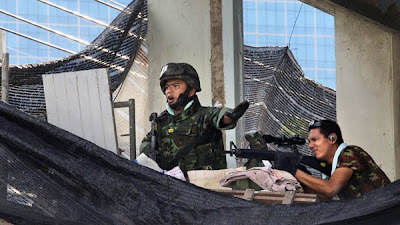 Security forces moved to regain control of a road close to the Suan Lum Night Bazaar, a popular spot with tourists, after Red Shirt protesters spilled out of their fortified rally base which was under siege by troops. Soldiers used tear gas against the protesters, who set fire to piles of tyres in the road, torched an empty police bus and vandalised army vehicles as well as a water cannon as part of their efforts to disrupt the lockdown. Volleys of gunfire rang out through the afternoon, sending people fleeing in panic. At one point troops fired directly at protesters and then advanced up a road shooting into the air. Two of the dead appeared to be Red Shirt security guards, said the director of the hospital where they were taken, adding that one victim was shot in the temple and the other in the chest. A third fatality was a 32-year-old man who died earlier of gunshot wounds. Red Shirt leaders have warned the government to prepare for a great, tragic night ahead. 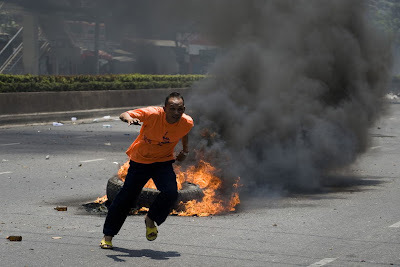 At least 35 people have been killed and about 1,000 injured in Bangkok in a series of confrontations and attacks since the protests began in mid-March. The mood was tense inside the encampment, which has been fortified with razor wire, truck tyres doused with kerosene and sharpened bamboo poles. "Abhisit has already started civil war," top Red Shirt Nattawut Saikuar said. "We urgently demand the government withdraw the military and stop all violence. I don't know how we can survive the night if Abhisit does not agree to a ceasefire." The Red Shirts consider Mr Abhisit's government illegitimate because it came to power in a 2008 parliamentary vote after a court ruling ousted elected allies of their hero, former premier Thaksin Shinawatra, who was unseated in a 2006 coup. Defence minister General Prawit Wongsuwon said the military operation was meant to force the movement's leaders back to talks with the government. The army had warned Thursday it would deploy snipers around the protest site and blocked roads to prevent more protesters joining in. A renegade general allied with the Red Shirts was fighting for his life after being shot late Thursday close to the protest site. His supporters said he was targeted by a sniper. The army denied any involvement in the incident. Major-General Khattiya Sawasdipol had a "low" chance of survival, said Chaiwan Charoenchokethavee, a hospital director. Shooting between police and army personnel was also reported at several locations, as policemen joined the side of the anti-government demonstrators. The emergence of divided loyalties among members of the security services transformed the stand-off with Thailand's Red Shirt opposition into a crisis for the government. The British Embassy, which stands just yards from the main demonstration site held by the opposition, was closed until further notice after a warning it was an attack target. The Red Shirts resisted Thai army efforts to impose a cordon as hundreds more joined the demonstration. Increased violence came in response to the shooting late on Thursday night of Major Gen Khattiya Sawasdipol, a renegade military officer who had built the fortified opposition encampments in central Bangkok. He was yesterday in intensive care as doctors operated on a gunshot wound to the head and a hospital spokesman said his chances of survival were "low". The government denied that an army sniper had shot him in the head. Spokesman, Panitan Wattanayagorn was unrepentant over the deaths and troops authorised to fire live ammunition at "terrorists" but only under strict rules of engagement that stipulated there must be a direct threat to life. Clouds of black smoke filled the streets as explosions and gunfire raged throughout the area of upmarket hotels and shopping centres where violence has been concentrated and was spreading across the main junctions of the central business district, Ratchaprasong. Grenade attacks caused damage at a shopping centre and a mass transit railway station. Mr Panitan said the military would step up its offensive in the days ahead. "In the next few days, they will be stepping up their security measures, especially outside of the Ratchaprasong area," he said. "They will continue to search for weapons. They will continue to adopt measures to try to reduce the number of protesters coming to the area." The deaths of nine men and one woman on Friday brought the numbers killed since demonstrators took over the area in March to 35, with hundreds more injured. The Red Shirts have demanded the resignation of Abhisit Vejjajiva, the Eton-educated prime minister, and early elections. Mr Abhisit was installed with the backing of key advisers of the royal household. His accession was tarnished from the start by the widespread belief that the same figures were behind the coup that deposed Thaksin Shinawatra, the populist prime minister in 2006. Mr Thaksin called on his successor to concede the demand for an early election in a statement issued from exile in Montenegro. "I believe that (a) political solution still exists for Thailand and the prime minister is able to prevent more casualties and save our country," he said. "All this is dependent on his decision and he can choose between violent means and peaceful means, or between his position and the lives of innocent people." The Red Shirt leadership offered a truce to the government as the spirits of the estimated 6,000 protesters rose. There was no response from the government on new negotiations. Hardliners have vowed to seal off the camp, cutting electricity, water, mobile phones and food supplies, while preventing reinforcements arriving to boost numbers. But the loyalty of tens of thousand of heavily-armed soldiers in the cordon around the camp is not assured. At one point yesterday soldiers used a loudspeaker to send a message to the Red Shirts: "We are the people's army. We are just doing our duty for the nation. Brothers and sisters, let's talk together." Observers believe many police officers are openly sympathetic to Mr Thaksin, who is a former policeman. The new arrivals and the latest killings lent the Red Shirt movement fresh impetus when it appeared to have been flagging after 62 days.